It is so hard to believe April is here! Just a few more weeks and SUMMER, oh glorious SUMMER, will be here. Not that we are counting, right!?!? I know that April can be a tough month. Spring break and testing can really throw a wrench in daily routines. Not to mention all the special events looming. Let's see... Field Day, Career Day, end of the year party, and I could go on and on. One routine that is so easy to lose in the shuffle is share time for writing. It is so important for kids though. It validates them as authors and allows them to celebrate learning, as well as seek advice from peers. So, how can you make the most of share time, when time is SO precious at this time of year? Here are a few ideas! Is time short? Can you barely fit in the five minutes of share time in your reading and writing workshops to begin with? I highly suggest using a very predicable structure with ingrained routines. When I taught second grade, my kids came to the carpet and sat in a circle. This way we could all look at each other, and not just me, the teacher! LOL! They brought their writer's notebooks and a pencil. The writer's notebooks and pencils HAD to lay in the floor in front of them and their hands in their laps. If they were playing with their notebooks or pencils, they went back to their seats. I was a meanie on this one #sorrynotsorry. I didn't have an author's chair. Honestly, any extra movement just took time. We shared from our spot on the carpet. 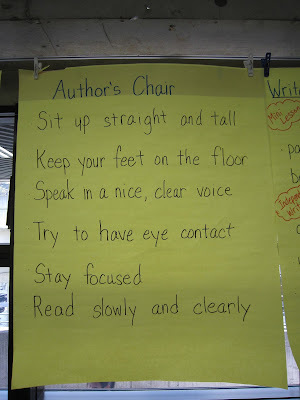 I love this anchor chart with procedures for the author's chair. 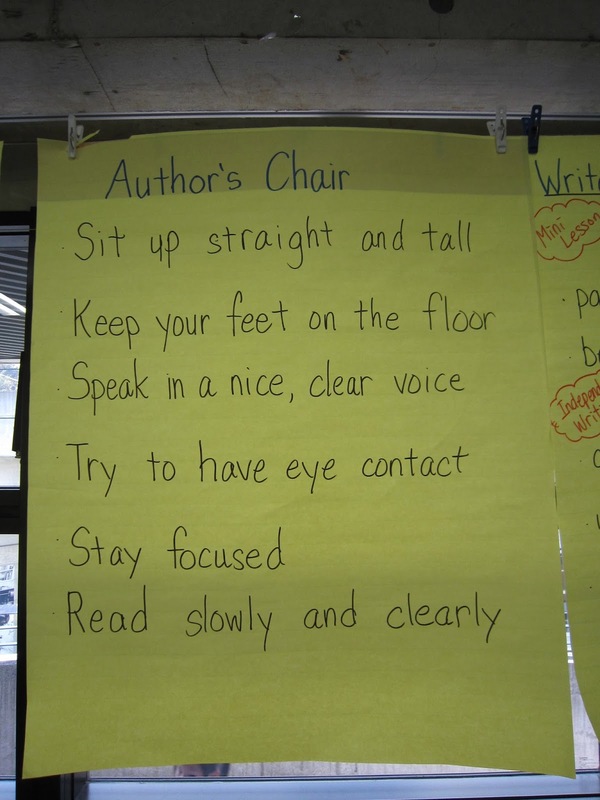 Although, we didn't have a physical author's chair, the procedures were pretty much the same. 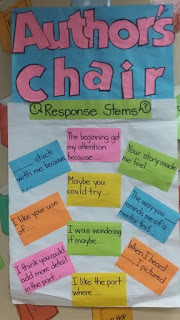 Sometimes, when I was conferencing with students I would ask them to share during share time. Often, this was because they had done a really good job of applying what had been taught in the mini lesson. It was also a good way to celebrate struggling writers that would not volunteer on their own. It prepared them for the share time, so they knew exactly what they would say before we ever sat down in the circle. We were also really specific in what we shared. Students could read their stories. Then, they could ask for specific help. This worked best with my gifted students. They often knew what they wanted the outcome of the writing to be, but weren't sure exactly how to get there. They were often able to explain this to classmates and get feedback. They REALLLLLLY liked helping each other! Looking back, I should have had these sentence stems to help kids give each other appropriate feedback. These look great. I love how this one has expectations AND the sentence stems together. Very smart. 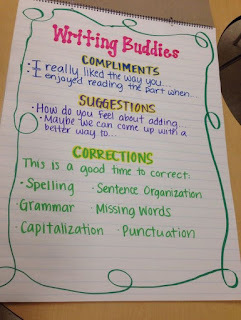 This one is pretty and has suggestions on complementing and how improve a peer's writing. Some of my friends loved to share. Others? Not so much. They would rather pick at the carpet and melt into the background. I get it. Sharing can be stressful for some kids. However, I did feel like all students need the chance to shine. To make sure that all students had an opportunity, I simply kept a class list on a clipboard by the carpet. Whenever students shared, I jotted the date next to their name. This helped me remember to call on some kids that rarely shared. Let EVERYBODY have a chance to share their work or writing by pairing kids up. You can make this as structured as you want. You can set a timer and when the timer dings, the students must switch so the other partner has time to share. This keeps one partner from dominating. I would suggest keeping pairs about equal, as far as ability. This does not embarrass a struggling writer and frustrate a gifted writer. Also, often gifted students tend to push and challenge each other. 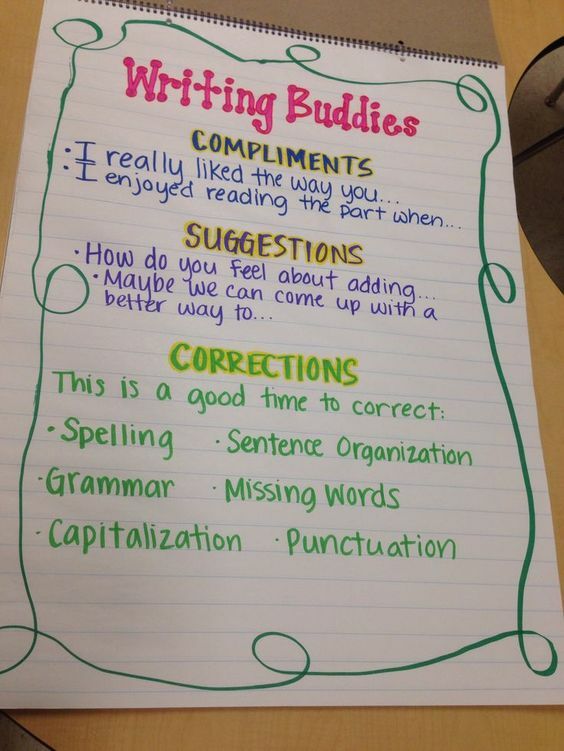 I loved this chart with guidelines for writing buddies or pairs because it gave them sentence prompts and also suggestions of what to fix. This doesn't need much explanation. Have small groups of students share. This can be the table groups they already sit at our you can mix it up a bit. A gallery walk is always fun this time of year. In this activity, students leave out their writing and classmates rotate around the classroom and comment on each other's writing. I find that this works best with an end of unit activity or a final draft. 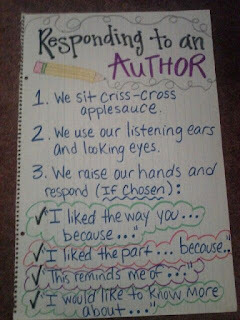 We sometimes did these as our publishing parties. Students each got a lunch bag and a small stack of blank papers. They would leave out their writing. Students would rotate around the classroom and comment (using the same procedures for positive feedback as whole group share) on the small slips of paper. The slips then went in the paper bags so they didn't lost. I kept the rotations structured and we switched seats at the ding of a bell, like we did when we played Scoot. Do you have any other ideas or suggestions for share time?